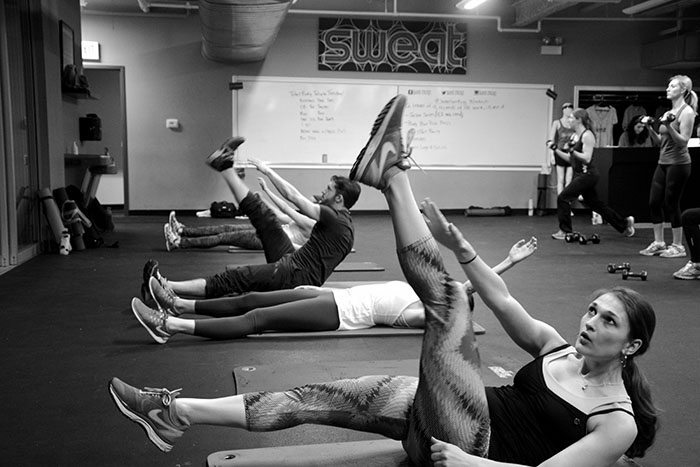 Ah #Sweatworking. The monthly event that brings a lot of joy to our sweaty faces. 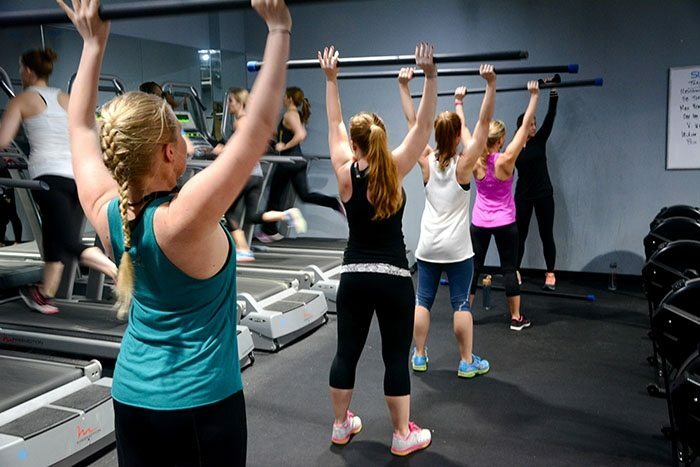 I love these sweat-fests because it gives us a chance to pack in two things you want to do anyway – hangout with people you like and get a workout in. 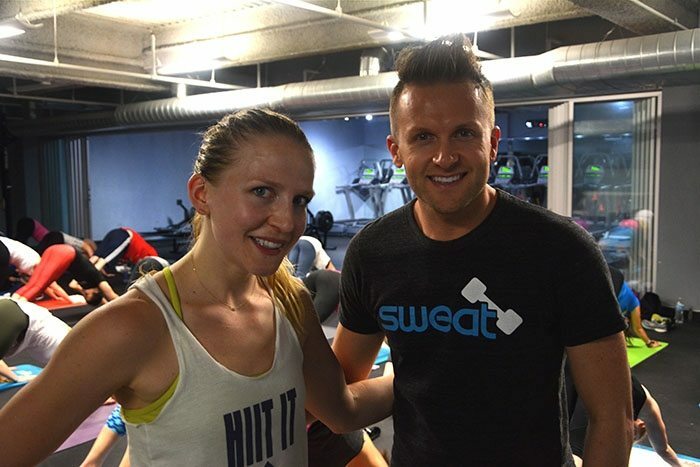 This month, we partnered with SWEAT Chicago for a two-part workout. 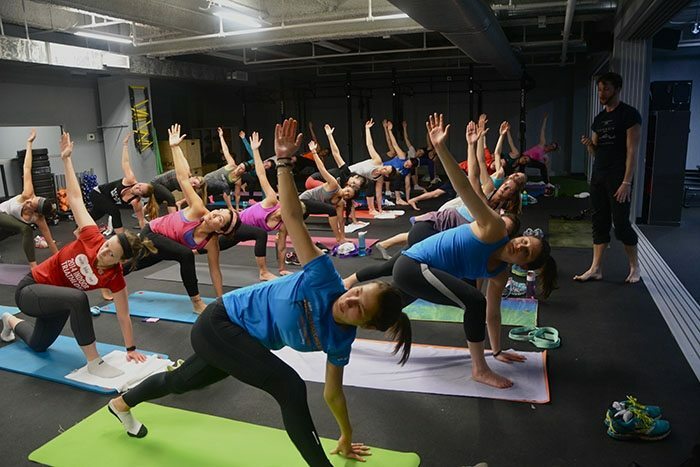 The first part was a compact version of a workout you’d get a SWEAT – 20 minutes of HIIT led by owner Paul Rahn – and the second part was a yoga flow led by YogaSix instructor Anthony. 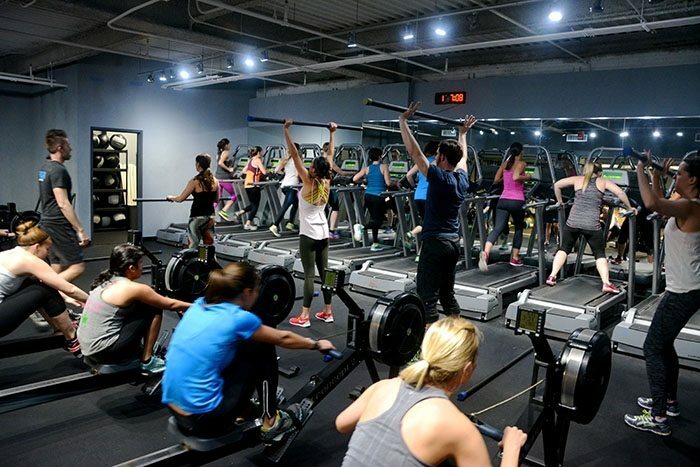 The two styles worked well together, with the first half of the workout spent getting the heart rate up and the second part lengthening the muscles and winding down. 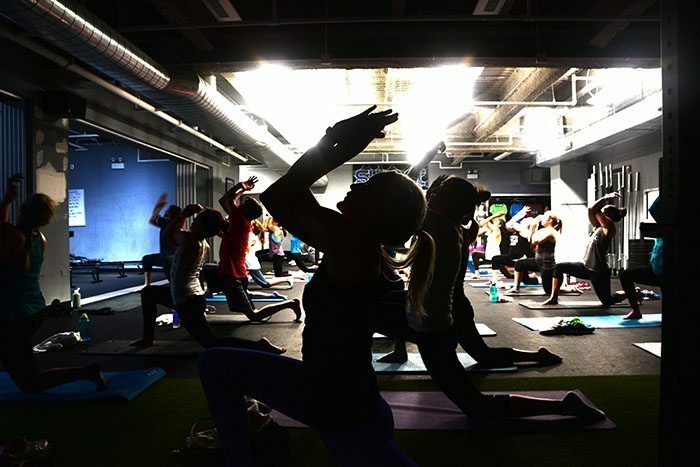 At every #Sweatworking, outside of packing the workout, we pack the house with healthy living brands for pre- and post-workout. 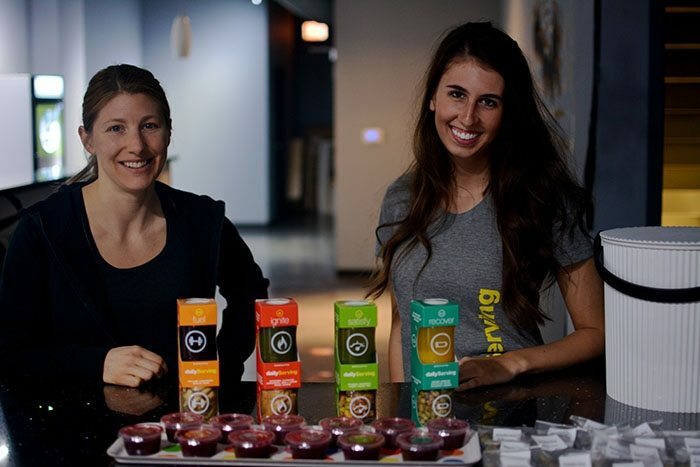 One special addition to the month’s event was a pre-workout snack by Chicago startup company, Daily Serving, which brought a quick-hit serving of fruits, veggies and nuts to fuel all of that sweating we were about to do. 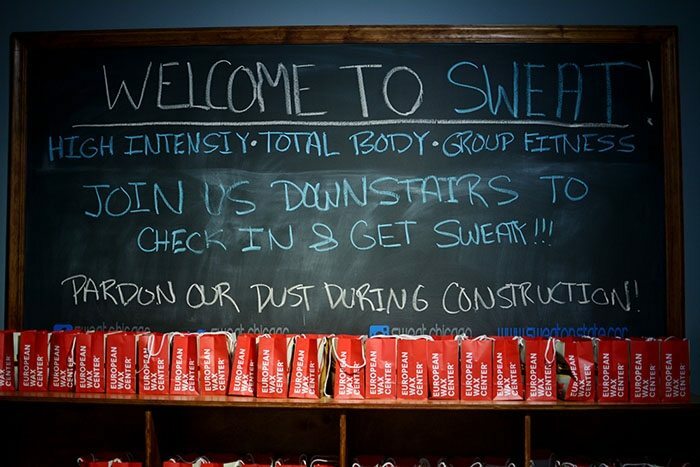 Once we were all checked in and ready to go, Paul and I kicked off the workout, asking everyone to introduce themselves to three new people. 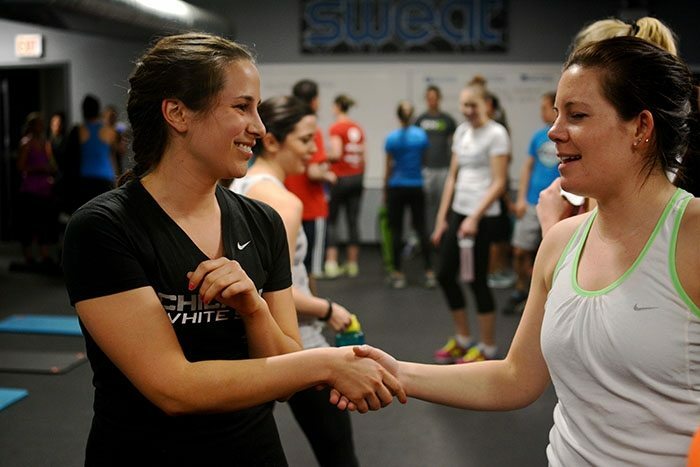 It’s cheesy, but this is my favorite part of #Sweatworking. The room is buzzing with people talking and getting to know each other for those quick 30 seconds. Once everyone made a new friend or two, we got down to business and Paul explained the workout. We did a five-station circuit, four total times, working for 45 seconds and transitioning for 15 seconds. 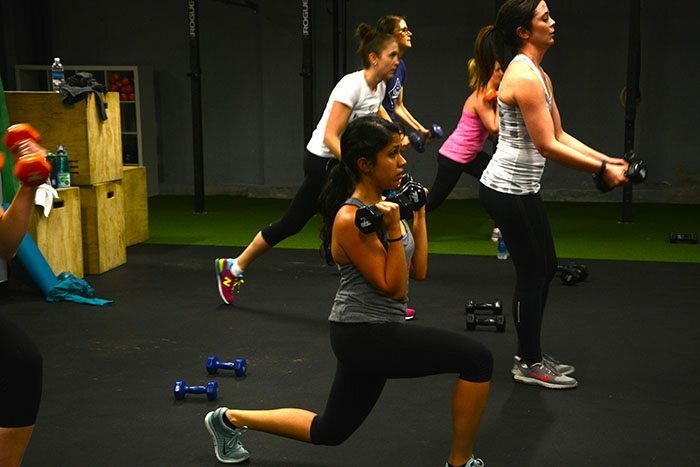 We did reverse lunges with a curl. Bodybar push-presses and treadmill runs. 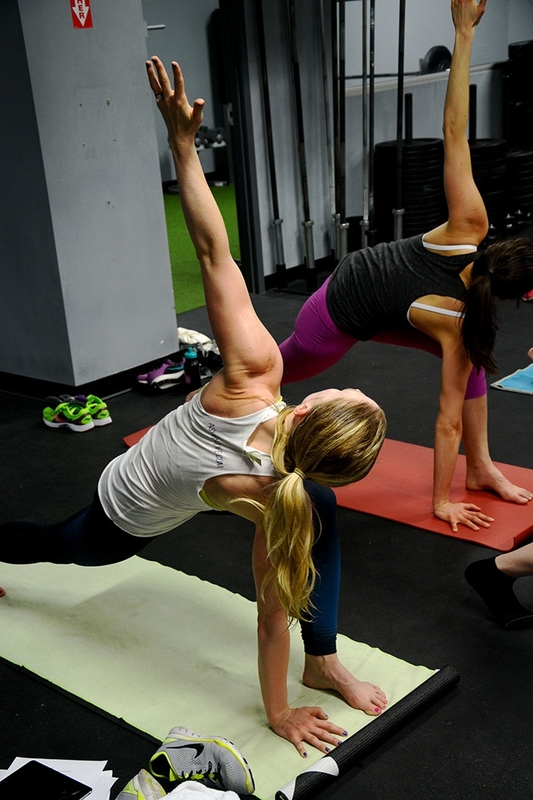 After those 20 minutes of work, we jumped into yoga while Paul and I took a quick beauty sweaty shot. 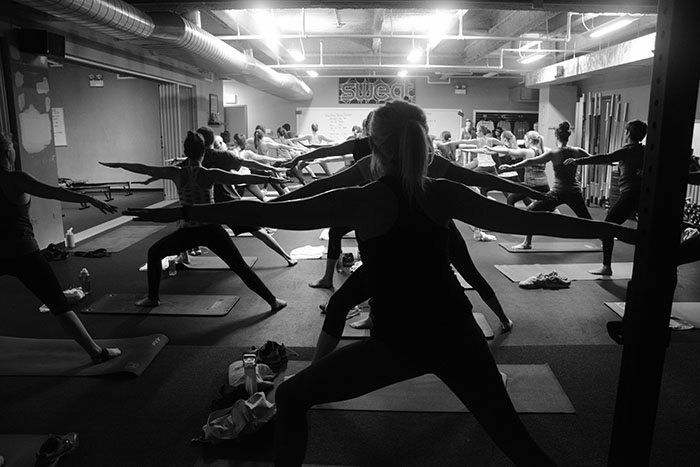 This flow was both challenging and restorative. We opened our hips. We worked through some twists. We worked on some balance. 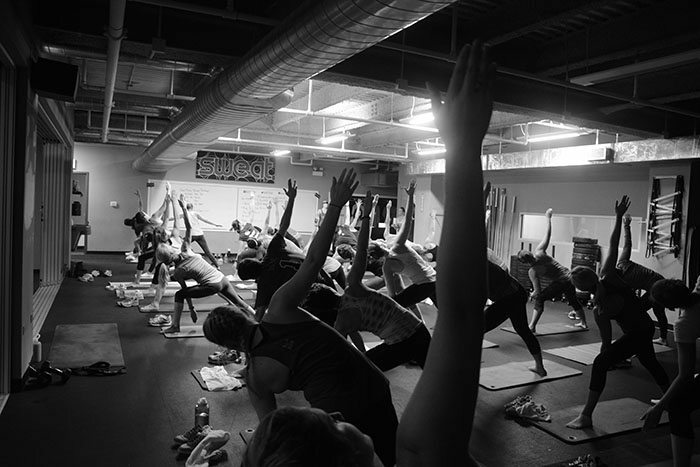 And, of course, we sealed the night with a hearty, “Namaste” before spending a little post-workout time unwinding. 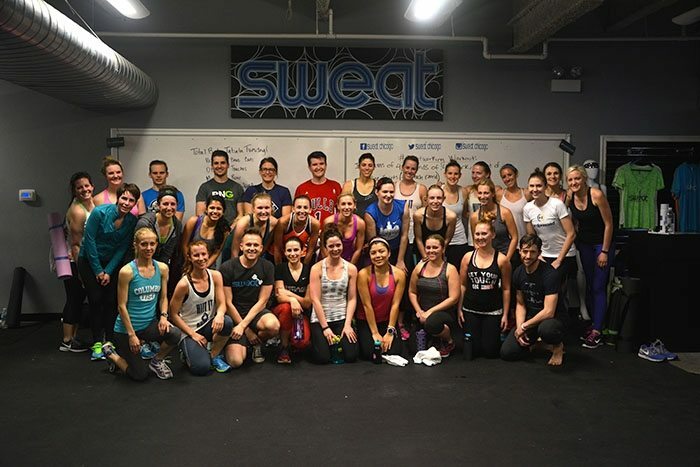 Just look at all of these sweaty, smiling faces. Cuties. After sweating our faces off and hugging it out in a group photo, there were snacks and drinks to be had. KitchFix, a company that kept Husband and I eating healthy when we barely had time to sleep, let alone cook, brought my favorite healthy dessert ever to grace the planet: Vanilla Cashew Yogurt with a Strawberries, topped with Paleo Granola. 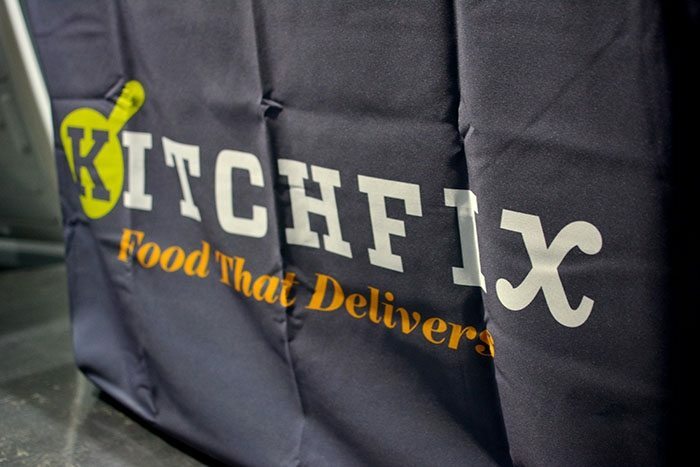 KitchFix, you guys. You can’t see the food here, because we ate it all. 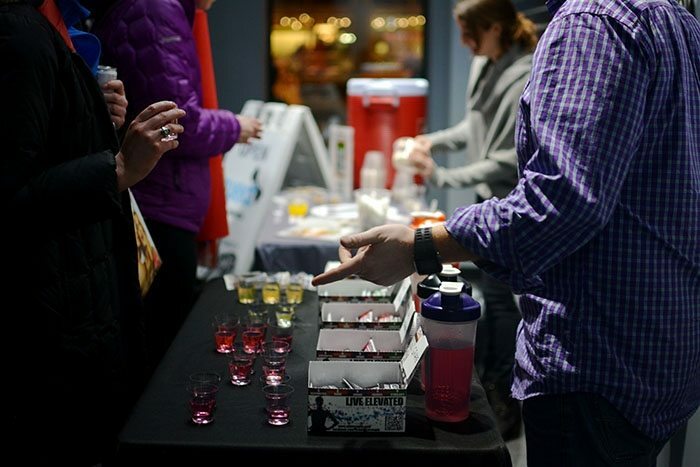 Another #Sweatworking favorite, MESTRENGTH was in the house offering samples of their delicious 0 calorie hydration powders with electrolytes and just a touch of creatine. I’m a huge fan of fruit punch, but I’ve heard a lot of buzz about Lemon Lime. In our take-home bags, we had a lot of goodness. For starters, the 88 calorie, sake based Social Enjoyments went like hot-cakes, probably because they’re delicious with just a touch of alcohol. We also snacked on KIND bars – both the savory STRONG bars and the fruitier bars. Everyone took home a VitaCoco in either Peach Mango, Lemonade or original. Bags were provided by European Wax Center and came stocked with a free wax for newbies. FOMO Active Wear sent lip balms for all. 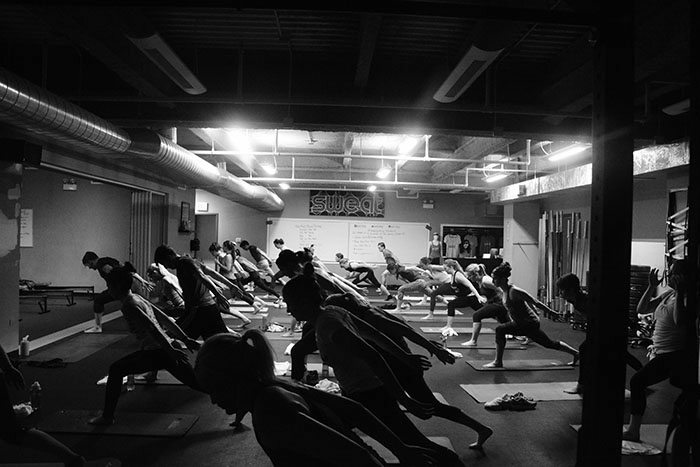 We also had $100 each to use towards a purchase of classes at YogaSix and a code for 25% off of classes at Sweat. Want to join us at the next one? 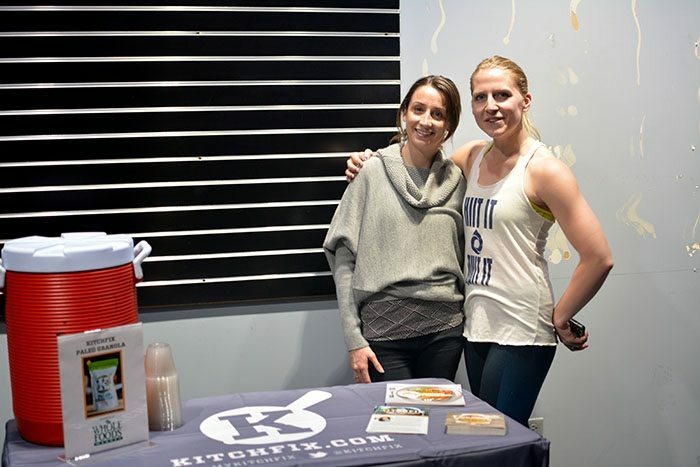 Read more about April’s event at POW! Grape MESTRENGTH all the way. What a great night!